I hope everyone had a lovely Thanksgiving! Mine was full of family, food and football. The perfect trio of “F’s” if you ask me! I’m honestly still a little full which coming from someone who eats gluten-free on a very gluten-centric holiday is saying a lot. There was plenty for me to eat thanks to my family and my boyfriend’s mom at each of the Thanksgiving meals I attended. For my part in these meals, I made my favorite sugar cookies, mini crustless quiches (but we added bacon! nom nom nom) and this glorious pumpkin pie spice cheesecake. Cheesecake is the perfect holiday dessert, don’t you think? 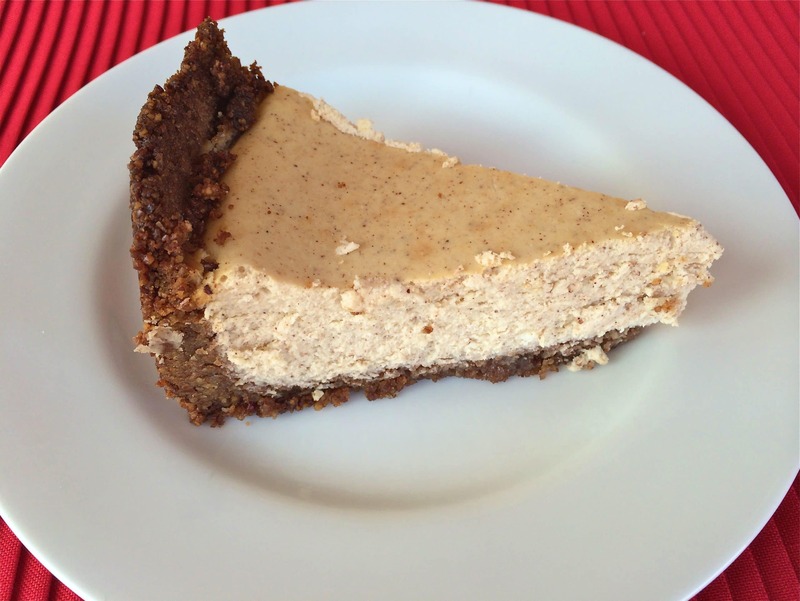 Well if you’re like me and can’t have any traditional graham cracker or cookie crusts with your cheesecake, this pecan crust is the perfect way to go! The crust is slightly sweet with a great nutty crunch from the pecans – absolutely delicious! And the filling – oh don’t get me started! I used 1/3 less fat and greek yogurt to lighten up this dessert and I honestly could not tell the difference, it was still so creamy! Also, the pumpkin pie spice is just the right amount in this recipe. It’s not over the top, but you can definitely taste the pumpkin flavors in the filling. I have some people who aren’t as much as of a pumpkin lover as I am and they loved this cheesecake – and I think you will too! Enjoy! Preheat oven to 350F. In a food processor, chop pecans until finely ground. Pour in a medium bowl and mix in brown sugar, melted butter, pumpkin pie spice, and salt until combined and the crust resembles wet sand. Press the pecan mixture into the bottom and sides of a 9 inch springform pan. Bake at 350F for 8-12 minutes, or until lightly colored and fragrant. Set aside. Reduce heat to 325F. In the bowl of a stand mixer, beat cream cheese, greek yogurt, and sugar together until combined. Add vanilla and pumpkin pie spice. Add eggs one at a time and combine until blended. Pour cheesecake mixture over crust. Bake at 325F for 55 minutes to an hour, until the center is just set. Allow to cool before removing from pan. Refrigerate for at least 4 hours.